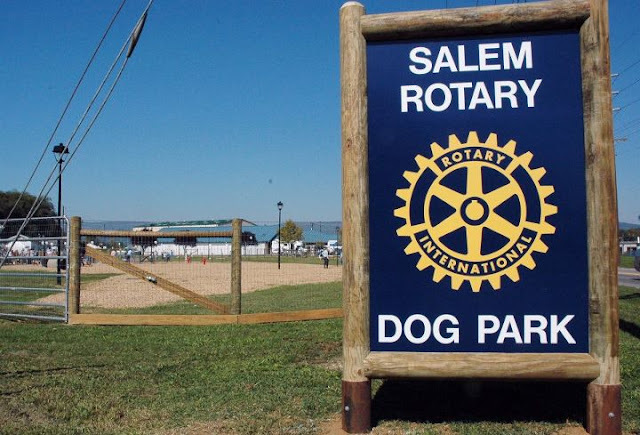 Today was the day our beautiful brand new Salem Rotary Dog Park had it's Grand Opening and ribbon cutting. Lexi, Nitro, Chris and I all attended this awesome event and took photos of the ceremony. I was nervous to let Nitro play in the dog park because he is deaf and I worried he wouldn't pick up the warning sounds from other dogs if they growled. Much to my surprise, Nitro was a perfect gentleman and he watched the other dogs body language very closely. At home he just gets in Bailey's face and barks very loud at her. With the strange dogs, he did not bark even once, he just played gently. I was very proud of him. Below is the video of Nitro playing with his new buddies. 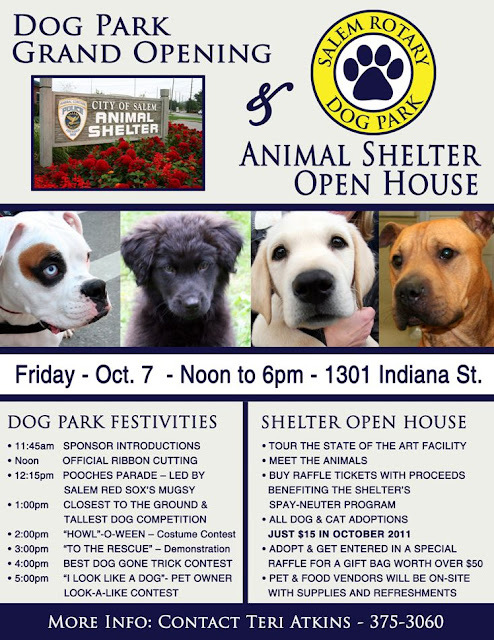 They even used Nitro's handsome face on their poster because this is the shelter we adopted him from. This is our City of Salem Animal Shelter. 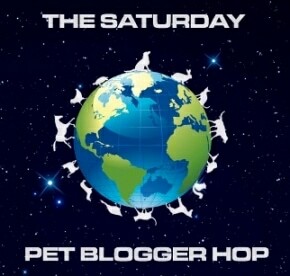 They are the shelter that saved my Nitro and where we adopted him from. The new Salem Rotary Dog Park is adjacent to the shelter. Nitro watching the City officials gathering to cut the ribbon for the Grand Opening of the Salem Rotary Dog Park. Nitro's daddy Chris and his little sissy Lexi checking out all the dogs waiting to go in and play in their new dog park. Lexi wasn't to thrilled to be there at first because I think when she saw all the other dogs she assumed she was going to the vet for a nail trim. She hates nail trims! See how worried she looks in the photo? Nitro looking back at me like..."when are they going to cut the ribbon already?" The big stuffed dog in the background is Mugsy from our local minor league baseball team the Salem Red Sox. Nitro used to play with Mugsy back in May at the Pet Expo when he was six months old. There were a few of the local media outlets covering the story. Mugsy came right over to play with Nitro because he remembered him from the Pet Expo this year. Nitro was so excited to see Mugsy and he sure remembered him from last May. He jumped up and gave him a big kiss! Look at the smile on Nitro's little face! Nitro is like: Yea...this is my DAWG! We met a puppy at the dog park that Nitro and I just fell in love with. He was a 9 month old American Bulldog-Mastiff mix. Isn't he just gorgeous? This is Nitro's "I'm about to pounce on you dude so we need to start playing" ..."are you game dawg?" Check out the cute terrier in the background..he was so cute! Little Miss Lexi visiting our friends inside the City of Salem Animal Shelter. She finally relaxed a little bit and stopped crying. All that visiting with all the other dogs completely wore Nitro out. All in all, it was a very good day here in Salem and we are so thankful to our friends at the City of Salem for giving us this great dog park. According to my dogs Lexi and Nitro, the City of Salem ROCKS! Wow, I kind of have to wonder what my dogs would do if presented with a giant, moving, talking, stuffed animal person. The weather couldn't have been better for this! I love the photos of Nitro and Mugsy! Too cute! Wish I could have been there. I'm glad to see Nitro got to play and all went well. He really is a gentleman. Have a great, sunshiney weekend! Congrats on the new park! What a great bunch of dogs! Congratulations on a wonderful new dog park! Did Lexi ever run and play like Nitro? @Minnie and Mack. Lexi did not play in the park. She only plays with Tallulah at home and no one else.